For Southwest Portland residents who are spatially attuned, possess an adventurous spirit or are searching for a new hobby, the Columbia River Orienteering Club's upcoming event might be worth consideration. The club will host the annual Multnomah Village Urban Night-O from 5:30-8 p.m. Sunday, Jan. 28, at the Lucky Labrador Public House (7675 S.W. Capitol Highway, Portland), sending participants out into the neighborhood on an urban scavenger hunt-of-sorts. 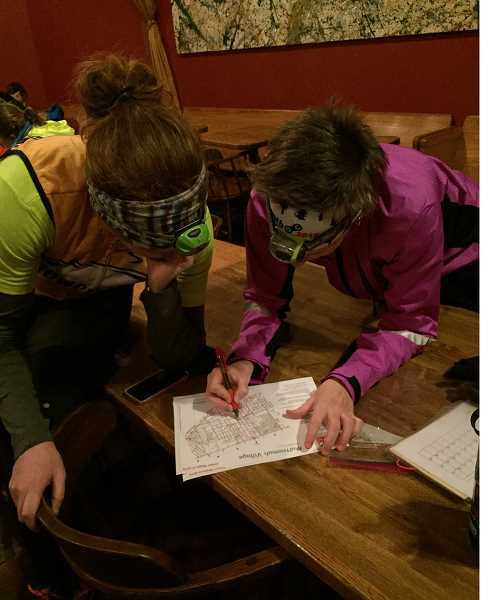 In the sport of orienteering, participants use maps, compasses and navigational skills to reach checkpoints and answer basic questions about the surrounding environment. The Multnomah Village event will include about 30 checkpoints scattered across the village, and the groups or individuals who reach these destinations and answer the most questions correctly win. The provided maps will not include street signs. "It's a way to get some good map reading practice and also some exercise. We call it walking with your brain turned on," Columbia River Orienteering Club officer John Godino said. For more information about the event, which is open to the public, visit the CROC website atcroc.org/events/2017/1/28/multnomah-village-urban-night-o . Typically, 60-80 people show up to the Multnomah Village orienteering event, most of whom are beginners. Participants can receive basic training upon registration. Godino said this event is easier than the average orienteering competition and is a gateway to more advanced competitions. "It is a little easier because it's on streets that many people are familiar with and have control points that are relatively close together," Godino said. In most orienteering events, flags are designated checkpoints. However, in the Multnomah Village event, fixed objects such as mailboxes or signs are used. "We like to use permanent objects because they won't be moved around or altered by anyone on the day of the event. They also can go back and continue to try the rest of the course if they didn't make it to points during the day of the competition," Godino said. Godino said orienteering skills are applicable to wilderness adventures. "It's map reading and compass use in a safe, controlled environment, and those skills transfer over to any outdoor adventure you would want to have," he said.